WordPress is a great blogging tool. It has a lot of potential and in it’s more recent updates, it has grown from simply a blogging tool to a content management solution. I use wordpress on this blog for two purposes – blogging and tweeting. You see, twitter is a great service but the 140 character limit is a pain. There are thus a lot of services that allow for longer tweets. But I prefer using my blog for long tweets using the hash tag #LongTweet. To tweet quickly from my iPhone, I want to use the WordPress app for iOS but it’s not adequate. So, I’ve built WordPresser. It’s a web app that uses HTML5 and XML-RPC to post to your wordpress.org blog. The link you need is – WordPresser. Open this in your iPhone or iPod’s Safari (opening it in any other browser doesn’t do much). Once you’ve opened it, save it to your Homescreen, it’ll save as a web app with the name “WordPresser”. Before you go further, there are two things you need to do with your blog. One is conventional, the other, not so much. 1. Enable XMLRPC – Under your WordPress Settings, under Writing, Enable XML-RPC by ticking that box under Remote Publishing. 2. Allow NiKhCo to access your Blog – Unfortunately, this part needs you to open the guts of your wordpress blog and add some code. After you’ve added the two header files, save the file and close it. Now you’re ready to use WordPresser. 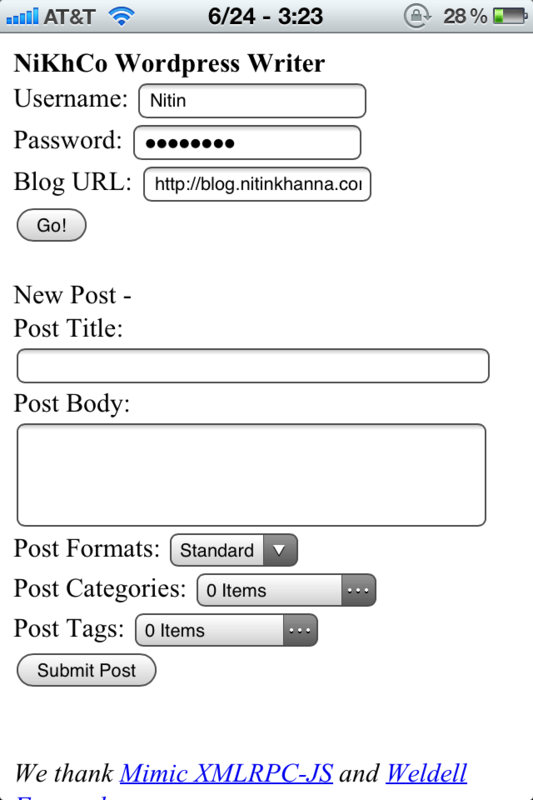 The first time you open it, you’ll need to enter three main things – your username, password and your blog’s URL in the format – http://blog.example.com or http://example.com/wordpress (which ever is your blog’s link. Note that there should not be a forward slash at the end of the URL). Once you’ve done that, just click “Go!”. It’ll take about 30 seconds and you’ll notice that the tags, formats and categories that you use on your blog will be populated on the page. The next time you open the app, you don’t need to click “Go!”. The app takes time but the tags etc load up and you’re ready to post. The post format is preset to “Aside” and you’ll be able to post a quick post to your blog with all the categories and tags that you want. This covers some of the basic functionality missing from the WordPress for iOS app. 1. Covers functionality that is missing from the WordPress app. 2. Based in HTML5, so fast app. It’s also secure as the app stores your password on your iOS device, nowhere else. 3. Continuous development with all your suggestions. 2. It’s not a native iOS app, it’s a web app. 3. App doesn’t allow creating new tags or categories yet. 4. App needs code to be added to your wordpress files, making the process non-user-friendly. 6. App hasn’t been tested on an Android device (for lack of Android device), though it should work on any HTML5 based browser, including Chrome.